I have recently realized that my standard chin rest and shoulder rest are possibly the cause of some discomfort after playing/practicing. The shoulder rest acts like a fulcrum allowing the violin to tilt into the collarbone causing it to rub, also the end pin digs into my neck. I've tried taking the shoulder rest off and using a pad like FM, but the chin rest is too low and too far to the left. 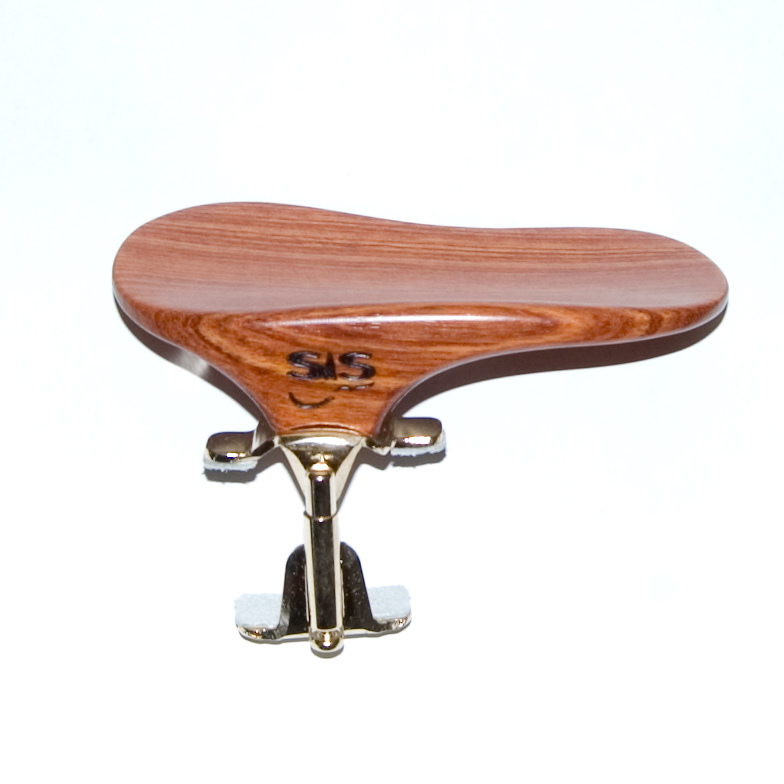 I have ordered a 35mm "Berlin" style chin rest so that I may try another type. If this doesn't work, I'll be looking for suggestions or I simply may make my own. And when oh when will I be a real person and won't need primary math answers any longer? Hi Tucs, I believe that style is called "flesch", correct me if I'm wrong. I saw those, but they looked too flat. Could have been just a bad picture though. Going to my local violin shop,,,,,well I live outside a town called "Gnaw Bone",,,we ain't got them here about. Though, right up the road we got the international violin competitions going right now. But the rest you have is what I'm after,,,getting more centered. Thanks. Yes Tucs. I've seen those chin rests. They look interesting being in the centre. May have to try one if I get the chance. pe that what you find is what suites you best. Thanks Cap'n. If I continue using a shoulder rest, I'll look into those. I wanted to throw one unusual chinrest out there- I had trouble with setup, and injury, too... especially since I have a long neck. I ended up with a solution that put height on the top of the instrument instead of from underneath, which helped my right arm as well, since the instrument wasn't so elevated.... These ones also adjust tilt- before you put it on the violin, you can loosen a screw underneath and change the tilt of the plate... They're kind of pricey, but worth it I think, and come in several different heights (the tallest is really tall!!!) They have them for viola, too! SAS Chinrests (from the UK maybe?) but sold in a couple of US shops. oh how neat! i'll have to check that chin rest out. I really wanna try to start playing without a shoulder rest, but my necks to long...very interesting!! thank you for sharing!! I also love that chin rest. I actually finally last night sunk into my chin rest while playing... sometimes I don't really sink in. That is a pretty chin rest and I like the options. Fiddlerman can the top part of that chin rest be removes and reinstalled in the opposite direction for us who play back wards? Very interesting, but what are the (what appears to be) screw holes in the top plate for ? Not screwing it to the violin I hope. Not sure what you mean but the raised part where the hardware is connected is there permanently and the holes are drilled etc. It's so adjustable that I don't think you can customize it. Pretty sure you can install it on the right side if that helps. In looking at the picture again I believe your correct it appears it would not fit properly turned around. Thanks, for looking. I have gone ''''''chin-rest-less'''''. For the past 10 days I am playing without a chin rest. I imagined and expected shoulder problems. But none so far. EDIT: On the below reply, I thought you were talking about "Shoulder-rest-less"
Congratulations suresh. Do you get a sense of freedom? Are you more or less locked into position? It works for some but not all. Our build has very much to do with it. and shoulder rest also? I have been wanting to try a tall chin rest and go shoulder rest-less. But I haven't figured it out. I should leave things alone I guess.. I feel pretty comfy. Thanks FM and Toni, I enjoy the freedom. I am well into position. I am very comfortable than I was. You should experience to believe it; but as you said it works for some. Toni I had never used a shoulder rest. What does not work for one, may work for others. May I get some hearing problem, being close to the left 'f' hole, only time will tell. 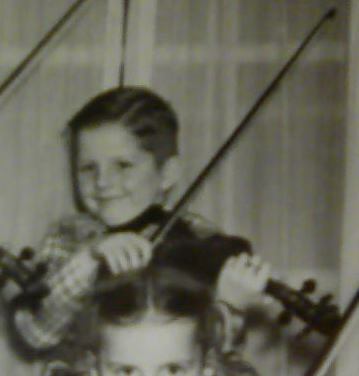 I sing with my violin.